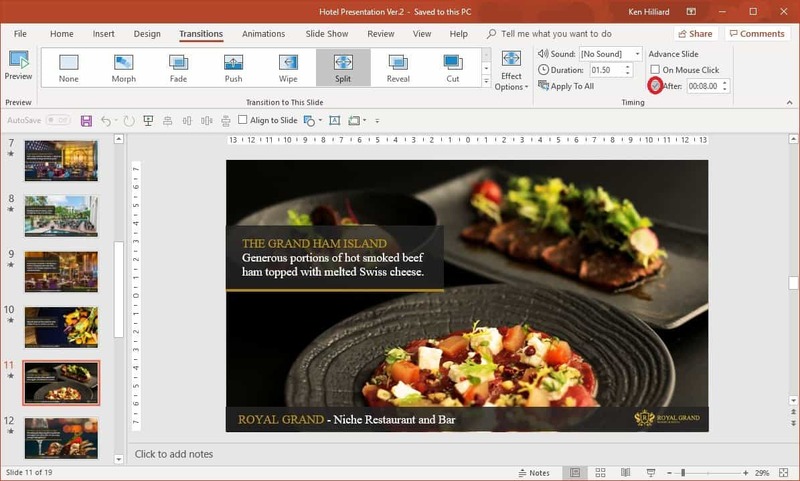 PowerPoint® is a fantastic tool for creating professional multimedia presentations. 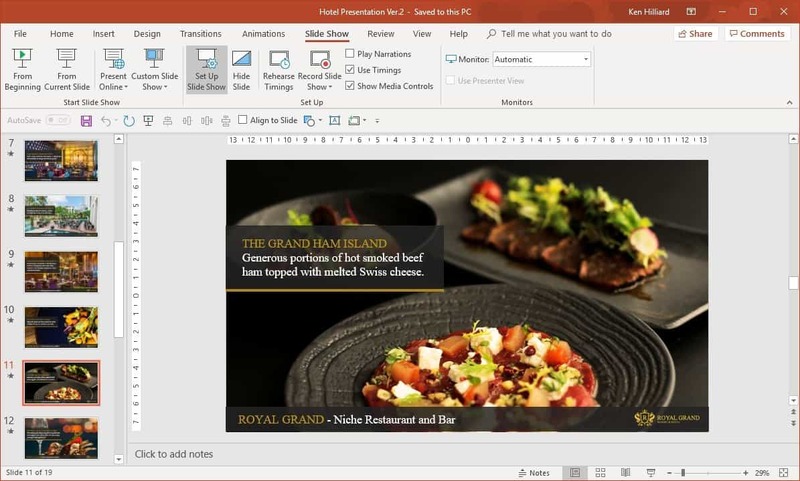 PowerPoint makes it easy to display presentations on Windows (and Mac) PC screens. However, there’s often a need to display a self-running PowerPoint presentation on a standard TV screen. So how to play PowerPoint on TV? This is not easy since TVs don’t have the ability to display native PowerPoint presentation files. There are actually two requirements to play PowerPoint on TV. First you must make your PowerPoint presentation self-running. This means your presentation runs in a continuous loop with any user keyboard actions. Second, you need a digital signage media player that can display PowerPoint files on your TV. To satisfy the second requirement we will introduce PowerPlayer™, our low-cost PowerPoint digital signage player that was designed to display PowerPoint presentations on any standard TV. By default PowerPoint requires a mouse click or keyboard press to advance to the next slide in a presentation. And when the last slide is reached the presentation automatically ends. 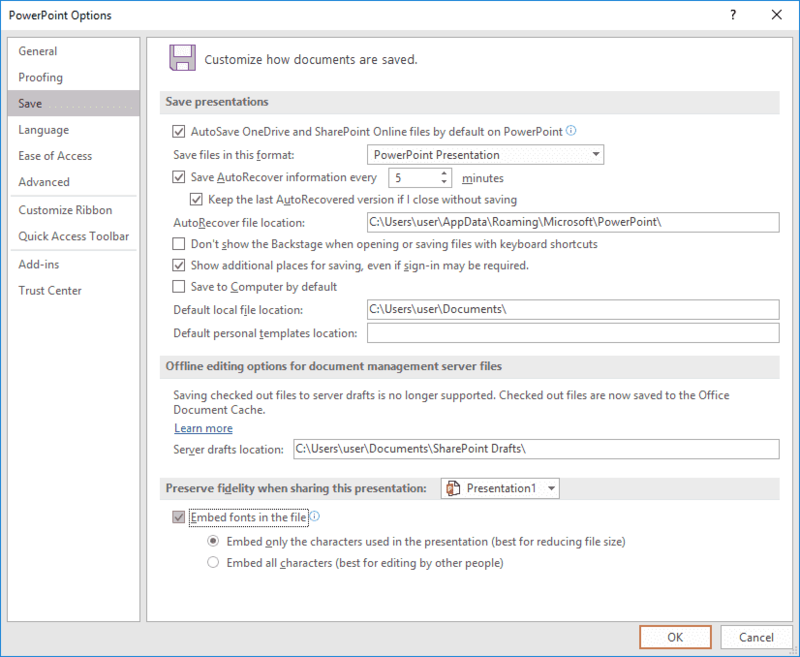 To make the presentation auto-advance without user input select Transitions from the PowerPoint ribbon menu. On the far right of the sub-menu, uncheck On Mouse Click and check After and enter the number of seconds you want the selected slide to be displayed. Repeat these steps for each slide in the presentation; or click Apply To All to apply the entered display time for all slides in the presentations (in the example shown above, each slide will be displayed for 8 seconds). The next step is to setup kiosk mode. This will cause your presentation to display in full screen and loop to the beginning when the last slide is reached. To setup kiosk mode select Slide Show from the PowerPoint ribbon menu then click Set Up Slide Show from the sub-menu. The Set Up Show dialog box will be displayed. 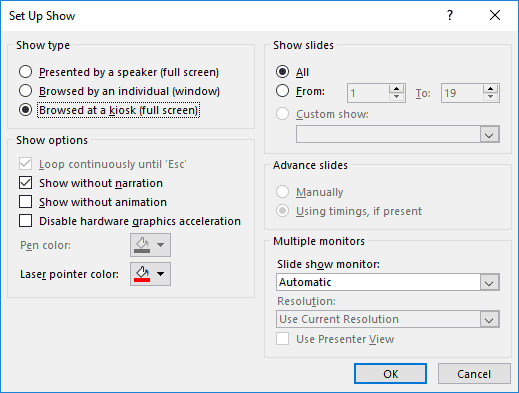 Click Browsed at a kiosk (full screen) and then click OK.
After performing these two steps your PowerPoint presentation will display each slide for the specified time. And when the last slide is displayed the presentation will automatically loop back to the first slide and continue. To properly display your presentation, the PC running your presentation must have the correct fonts installed. Otherwise your presentation may not look as intended. To remedy this potential problem simply embed the presentation’s fonts in the saved PowerPoint file. To embed fonts select File on the PowerPoint ribbon menu and then click Options. From the PowerPoint Options menu click Save. At the bottom of the Save menu check Embed fonts in the file and then click OK.
For more information please take a look at our PowerPoint to Digital Signage Guide. 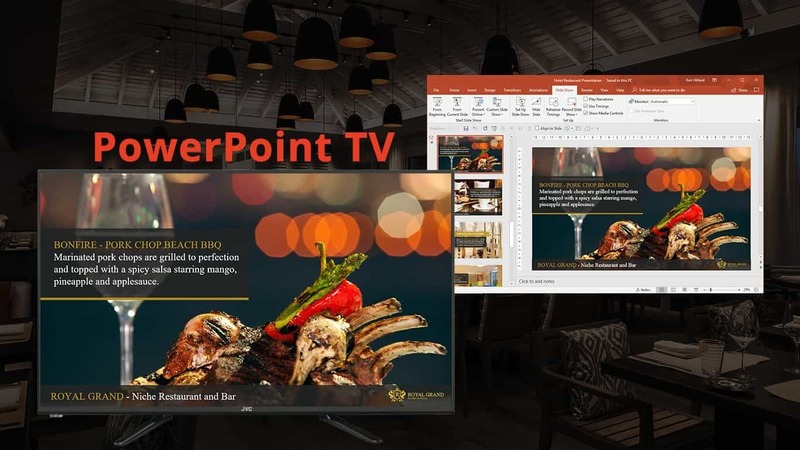 Once your presentation is self-running you will need a media player that can display PowerPoint files on your TV screen. Our PowerPlayer product is an example of a low-cost digital signage player that supports native PowerPoint file formats. PowerPlayer is a pocket-sized Windows 10 PC stick that plugs into your TV’s HDMI source input. PowerPlayer is bundled with PowerSignage™, our cloud-based content management service (CMS). PowerSignage CMS makes it easy to upload, schedule and display PowerPoint presentations on your TV. PowerPlayer automatically downloads PowerPoint presentations from the CMS and displays them on the TV screen. So, how to play PowerPoint on TV? First make your presentation self-running, as described earlier. Second, use PowerPlayer to display your PowerPoint presentations on any TV with HDMI. Take advantage of our cloud-based content management to upload, assign and display PowerPoint presentations to your TV points. For more information take a look at our PowerPlayer product brochure or visit our website at www.powerdigitalsignage.com.